EVGA stuck to reference cooling for their card. 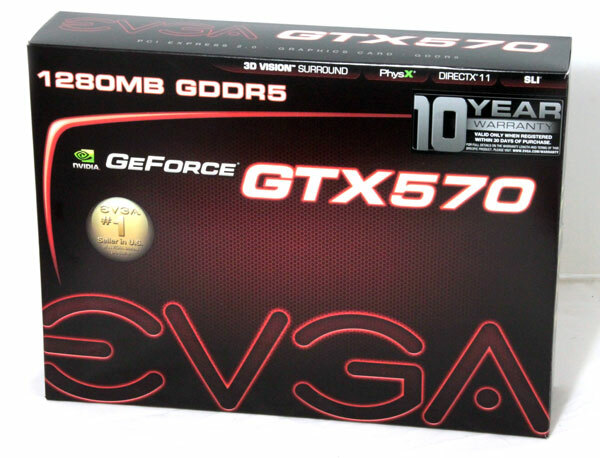 Note that EVGA's GeForce GTX 570 Superclocked requires two slots in your system. Except for the sticker and clocks of course, GTX 570 Superclocked is no different than the reference. The following photo shows reference GTX 570 and GTX 580 cards. The differences in cooling are only evident when you take the cooling apart. The following photo shows GTX 580’s and GTX 570’s cooler. GTX 580 is the upright one. 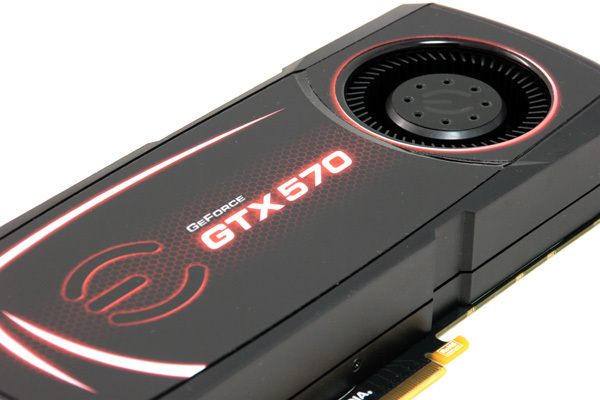 With help from the vapor chamber technology, the GTX 570’s cooler is really quiet. Unlike the long heatpipes which transfer heat from the copper base to aluminum fins, Vapor-X chamber is a component that brings both copper-base and heatpipe functions together. The advantage is in direct contact with the GPU and a large surface of only a few millimeters thick Vapor-X chamber, which comes in place of the copper base. It then directly receives and transfers heat to the aluminum fins, maximizing heat transfer between the GPU and the rest of the heatsink. When it comes to performance and thermals, reference dual slot cooling on the GTX 580 / GTX 570 ended up being much better compared to the GTX 480’s. The plastic hood covers the entire card and all that’s visible is the blower-style fan, which exhausts hot air out the back of the system chassis. 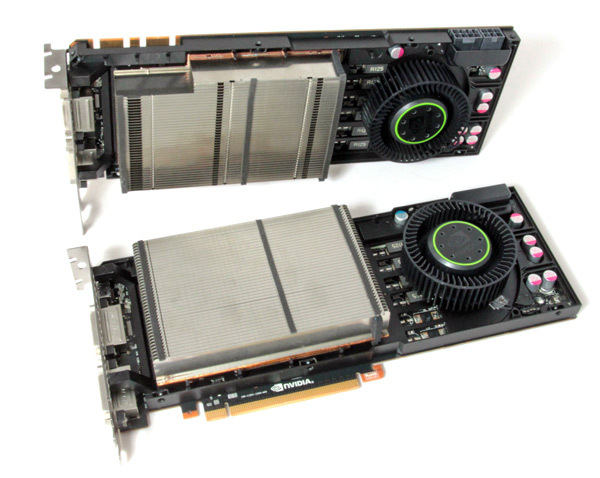 Geforce GTX 580 and Geforce GTX 570 feature a new adaptive GPU fan control algorithm that smoothes the ramp up/down of the fan speed under load. 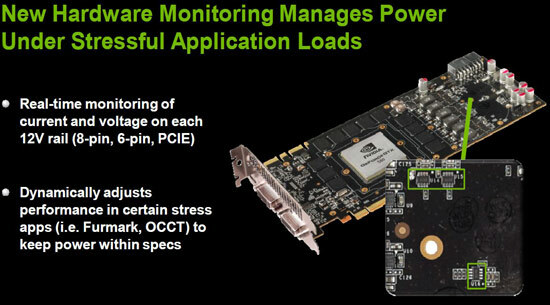 Nvidia added Advanced Power Management, a feature which monitors consumption and performs power capping – all to protect the graphics cards from excessive power draw and potential damage. It appears that this method is fast becoming a trend as AMD implemented a similar tech on its HD 6900 series. When the sensors detect higher than allowed consumption (on all three 12V rails, i.e. PCI-E slot, 6-pin and 8-pin connectors), GTX 570 automatically downclocks and reverts to original clocks when the overcurrent is over. HD 6900 series allows for monitoring of clock changes in GPUZ, but in the case of GTX 580/GTX 570 it is not so simple. Good thing about both HD 6900 series and GTX 570 is that they can enter several low-frequency states, whereas the GTX 580 can only downclock by 50%. 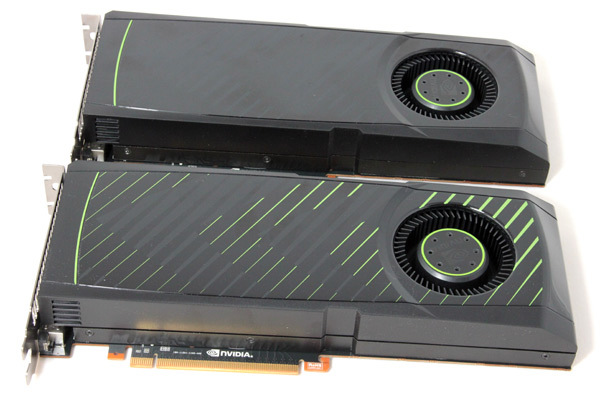 GTX 580/570 is the same size as Geforce GTX 480, measuring 10.5 inches or 26.7 centimeters in length. 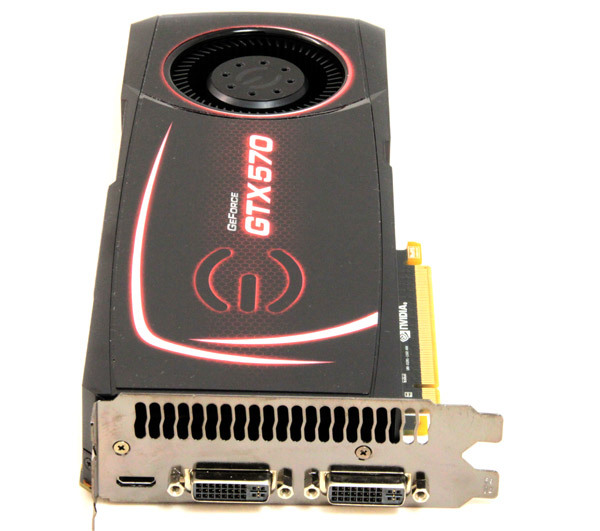 GTX 570 has two 6-pin power connectors maximum graphics card power 219W (for reference card) compared to GTX 580 which has one 6-pin and 8-pin power connector and maximum graphics card power 244W. The video engine didn’t change; it is the same as on GF100, Fermi chips. You still have maximum of two display supported, no DisplayPort, at least not on reference boards (According to NVIDIA the card also supports DisplayPort if board partners want to use it.). The Superclocked card has two dual-link DVI ports and one mini HDMI interface is HDMI 1.3a compatible. The mini HDMI cable might be bundled by partners and if not it will cost you much more than a standard full size HDMI that you use for your HD TV. EVGA included a mini HDMI to HDMI adapter cable. Nvidia included an HDMI sound device within the GPU, so there is no need for connecting the card to your motherboard’s/soundcard’s SPDIF out to get audio and video via HDMI. 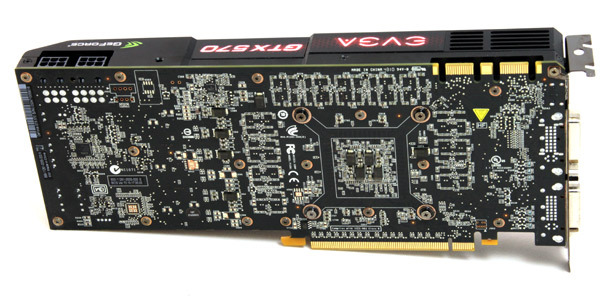 GTX 570 comes with two SLI connectors. 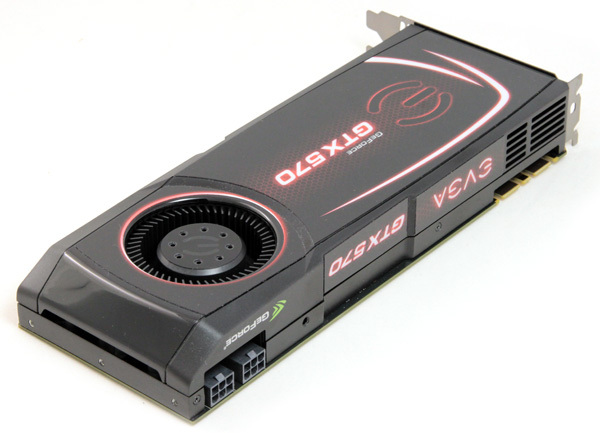 This means you can combine up to four GTX 570 cards in SLI mode for improved performance or image quality settings. 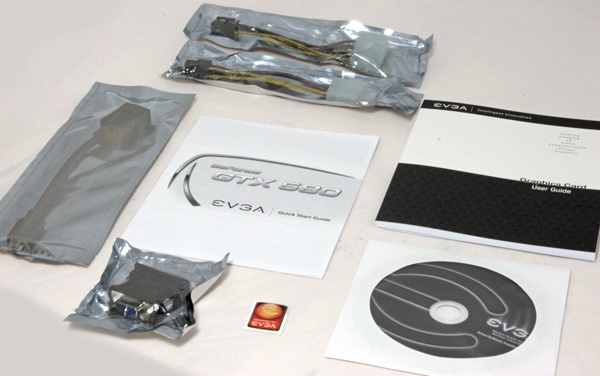 The EVGA GeForce GTX 570 Superclocked uses 1280 MB video memory. The chips used are K4G10325FE-HC05 parts from Samsung. 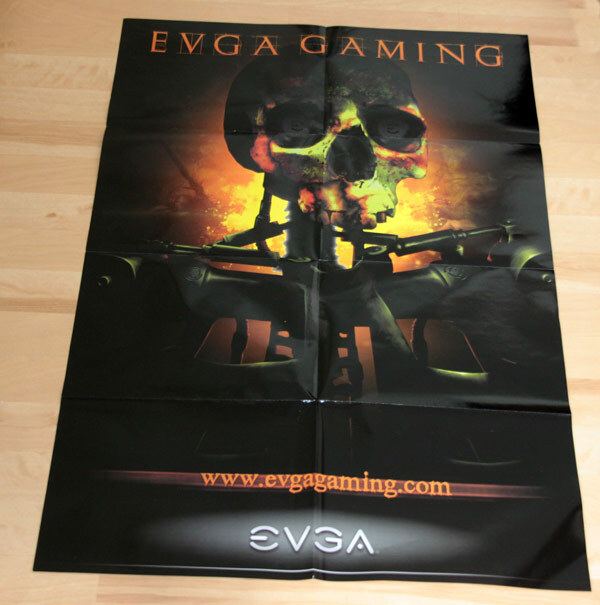 You’ll find a mini-HDMI-to-HDMI adapter in the box, as well as the large EVGA poster.